Nana Kwabena Adu-Hene, Technology Director handing over a router to the Adenta Police command. 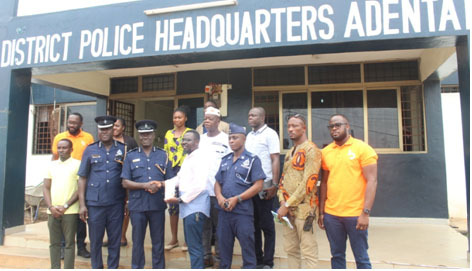 Four divisional headquarters of the Ghana police service have benefited from a free internet solutions system from Busy Internet. The beneficiary divisions; Madina, Adenta, Kaneshie, and Amasaman will enjoy a complete internet solution for a year, free of charge. needed technological tool to improve their day to day operations. with the right tools to be able to discharge their duties effectively. connectivity at the aforementioned divisions was to also help combat crime. Accra and Tema regions respectively,” he revealed. was full of gratitude for the great work Busy Internet was doing. broadband services in January 2016.